With all of the negative things going on in the world, it’s easy to fall into a pattern of just focusing on the bad. In fact, the media is famous for inspiring those kinds of attitudes. Fear and hysteria get ratings, it is as simple as that. Well, I’m making a conscious decision to focus on the awesome things that people are doing for each other. Like the lady that bought an entire toy store in New York to donate the contents to homeless shelters. Or Mark Zuckerberg pledging his $45 billion dollar Facebook fortune to charities. There are good people in this world but, unfortunately, their stories aren’t as good at selling newspapers and grabbing viewers as the stories of the bad people. One such person that is doing amazing things is R&B singer, Akon. 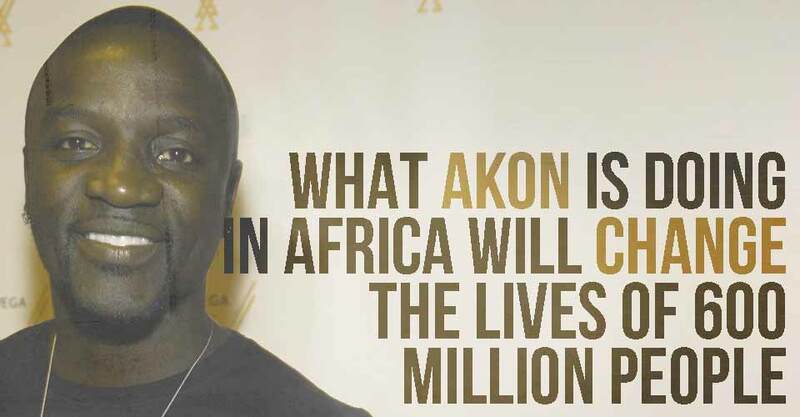 Through his foundation, Akon Lighting Africa (ALA), the musician is aiming to provide power to 600 million Africans in rural areas that need it the most. For most of us, we can’t imagine a world where there is no such thing as something as basic as a light switch. In these villages, the production revolves around daylight. To date, ALA has provided solar street lamps, micro-generators, charging stations, and home kits in over 11 countries. They’ve done this through a $1 billion dollar line of credit that’s been established by a Chinese solar systems company. In addition to providing the equipment, ALA has established the Solar Academy that teaches people how to install and maintain the solar systems. The following video from ALA details the program and shows reactions from the very people whose lives have been changed. The world needs more Akons.